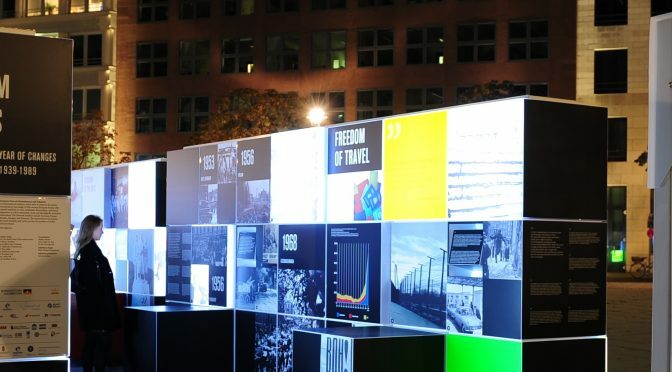 On the eve of the 25th anniversary of the fall of the Berlin Wall, a unique exhibition entitled ‘Roads to 1989. East-Central Europe 1939-1989.’ was launched in the German capital. The exhibition documents the complicated process through which this part of Europe regained its freedom from communist dictatorship. 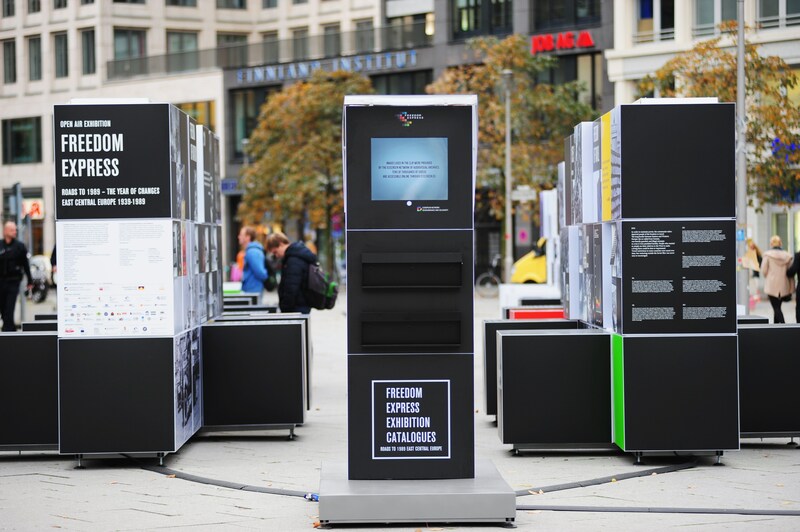 The exhibition is part of ‘Freedom Express’, a social and educational campaign organised by ENRS, ministries responsible for culture in Poland, Germany, Hungary and Slovakia and local partners. EUscreenXL Consortium and Europeana are partners of the project. The exhibition concentrates on the various ways in which civil liberties were limited in the former communist block and on attempts made to regain them. It focuses especially on the question of what connects and divides remembrance of the events that preceded the fall of communism in Central and Eastern European. The content of the exhibition reveals a story of the different faces of freedom. Individual parts of the exhibition are devoted to freedom of speech and expression, freedom of religion and belief, economic freedom and other themes. EUscreenXL contributed to the exhibition by creating a unique, moving and historically meaningful video production. It includes archival content that shows important and commonly recognizable personalities and events from the political transformation time in Europe of 1989 and depicts crucial social phenomena also typical for the period. It represents one of the first try-outs of the EUscreen Network activities aimed at reaching new audiences and stepping out of the online world by preparing a physical exhibition. The video was created by EUscreenXL partners – Deutsche Welle, The Lithuanian Central State Archive, RTV Slovenia, Czech Tevision, National Audiovisual Archive of Hungary, National Audiovisual Institute of Poland (in collaboration with Video Studio Gdańsk), and The Netherlands Institute for Sound and Vision. 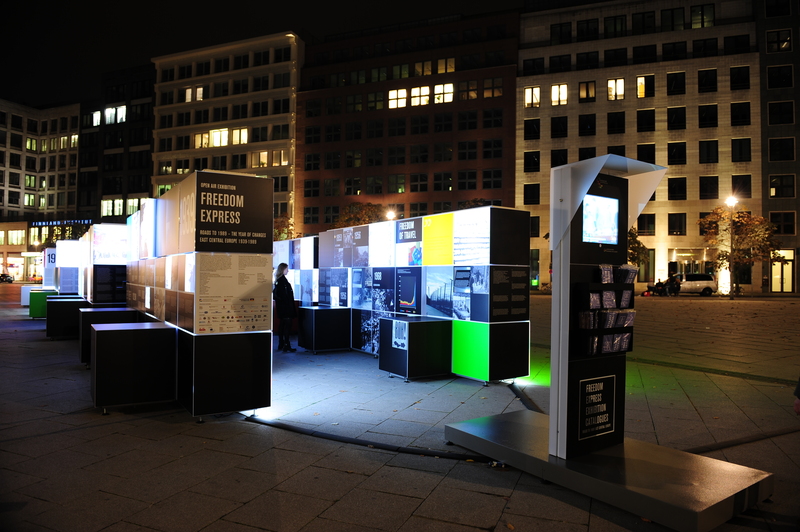 The exhibition will be shown on 4-10 November on Dorothea-Schlegel-Platz – a square located close to the historic Friedrichstraße train station, which, between the years 1961 to 1990, served as a railway border crossing between East and West Berlin. After Berlin, ‘Roads to 1989’ will be shown this year in Brussels (14-24 November) and Warsaw (28 November-15 December). Alongside the European tour of the exhibition, its digital version is also available at: http://1989.enrs.eu/exhibition. Freedom Express is asocial and educational campaign organised by the European Network Remembrance and Solidarity. Its first part was a study trip whereby a group of young artists, journalists and historians visited Solidarity’s Gdańsk, then Warsaw, Budapest, Sopron, Timisoara, Bratislava, Prague and Berlin. The trip’s agenda of meetings, workshops and artistic activities was made possible thanks to the cooperation of a number of institutions involved with 20th century history. More information is available at www.freedomexpress.enrs.euYou can also follow the event on Facebook.